00:00 All-Ireland Under-15 Duet Champions for 2013, Cliodhna Ní Éanáin and Jack Mac Partaláin, CCÉ Ormond, Nenagh play a reel - “Morning Thrush”. Recorded in Rohan’s, Nenagh just before their success. 02:25 Fiddle players Jayne Pomplas from Rochester, New York and Armand Aromin, who is a well-known fiddle maker, play “The Concert Reel” at one of the many informal sessions at the North American Comhaltas Convention in New Jersey, April 2014. 04:34 Three flute players with the famed Brú Ború group from Cashel, Co. Tipperary - Pauric Stapleton, Jim Egan and Conor Arkins - play a selection of reels: “O’Mahony’s” and “Mossy Banks”. Accompaniment is by Mary Kelly on harp and Eamon Moloney on bodhrán. Brú Ború were special guests at the Comhaltas Convention 2014 in New Jersey. 07:36 A selection of jigs - “Holly Blue” (which Conor composed) and “The Trip to Athlone” - played on tin whistle by Conor Cronin who lives in Toronto, Canada and is originally from Dun Laoghaire, Co. Dublin (Conor learned mychof his music at Comhaltas Headquarters in Monkstown from the late Brian Prior and Brendan McCabe and also Sarah Jane Woods). Recorded at the Comhaltas Convention in New Jersey, USA in April 2014. 10:07 “The Sunshine Hornpipe” played by All-Ireland Under-12 Fiddle Champion Haley Richardson, Delaware, USA at the 2014 Comhaltas Convention in New Jersey. 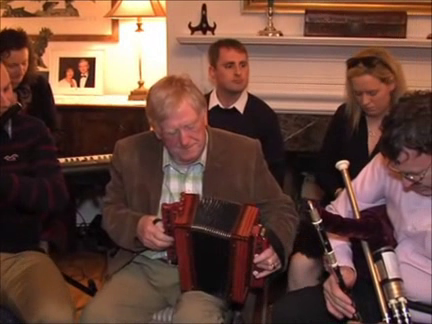 11:49 A selection of music by members of Brú Ború, one of the many performers at a special reception in the Irish Consul’s residence in New York, which Consul General Noel Kilkenny and his wife Hanora hosted to honour the holding of the North American Comhaltas Convention 2014 in Parsippany, New Jersey. They play a selection ending with “The Glen Allen Reel”. Full list of Brú Ború Tour Group Members: Bobby Gardiner (accordion), Jim Egan and Pauric Stapleton (flutes), Pádraig Donlon (uilleann pipes), Claire Quinn, Finbar English, |Conor and Eimear Arkins (fiddles), Peter Denmead and Shauna McGarrigle (concertinas), and Mary Kelly (harp); Singers - Nora Butler and Seán Ó Sé; Dancers - Aishling and Gráinne Prendergast, Kathy McGrath, Aoife Newe, Liam Guiney, Fernando Marcos and Mark Nester. 15:31 One of our great lilters, Séamus Fay from Cavan lilts two reels - “Arkle Mountain” and “Micko Russell’s”. Recorded at a session in Boylan’s Pub, Kilnaleck, Co. Cavan in March 2014. 17:54 All-Ireland Under-18 Fiddle Champion 2011, Rebecca McCarthy Kent from Tromore, Co. Waterford plays the three-part hornpipe “The Cuckoo’s Nest”. Recorded at Mary Immaculate College, Limerick on 8th April, 2014.